They fight corruption in Nigeria. They support the rule of law in Burma. They support democratic institutions in Kyrzakhstan and Georgia. Come again, Mr. Secretary? Kyrzakhstan? Aren’t you confusing volatile Kyrgyzstan, where popular protests overthrew two authoritarian leaders in less than five years, with its stable neighbor Kazakhstan, where President Nursultan Nazarbayev has ruled almost unchallenged since independence in 1991? The confusion is symptomatic of a more general geographical malaise, caused by the collapse of the Soviet Union and the proliferation of countries whose names end in -stan. Kerry is not the first and will not be the last public official to become lost in Stanland. The imprecise reference is to a vast swath of Asia, stretching from Turkey to the western border of China, populated by a bewildering assortment of ethnic groups that give their names to an equally bewildering collection of provinces, autonomous republics, and countries. Remembering them all—not to mention finding them on a map—is a challenge, even for people who are supposed to know these things, such as diplomats and international relations experts. It’s similar to the geographical confusion brought on by the end of European colonialism in Africa a half century ago. It wasn’t enough for the imperial powers to surrender their political and economic dominance. They also had to learn postcolonial geographical vocabulary. It’s not Upper Volta any more. It’s Burkina Faso, and its capital is—get ready to roll those vowels—Ouagadougou. We all construct mental maps of essential information, and our maps are shaped as much by culture and pragmatism as by physical features and political boundaries. Of course, we all know about other places, but they don’t appear in our mental maps, not even on the fringes, unless they seem relevant. Even though Afghanistan has been embroiled in conflict since the Soviet invasion of 1979—or, to take a longer historical perspective, since the first Anglo-Afghan War of 1839–42—it was not on most Americans’ mental maps before September 11, 2001. As long as Afghanistan and Pakistan were the only “stans” we had to remember, the map was reasonably manageable. Then Mikhail Gorbachev came along. The collapse of the Soviet Union gave us fourteen new countries (plus Russia) including the five “stans” of Central Asia—Kazakhstan, Kyrgyzstan, Tajikistan, Turkmenistan, and Uzbekistan. We can be grateful the Soviet Union did not break up any further, or we would have to deal with Bashkortostan, Dagestan, and Tatarstan (now Russian republics). Or that Armenia did not adopt its native name, Hayastan. Or that the Central Asian republics themselves did not splinter, with Karakalpakstan breaking away from Uzbekistan. 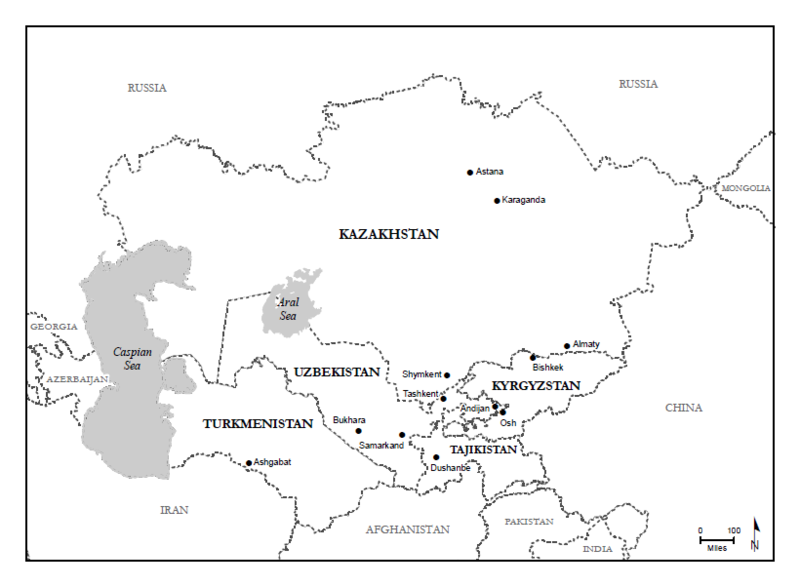 If we struggle to remember the “stans,” is it more helpful to think about “Central Asia”? It depends. In terms of geopolitics, it’s a more elastic region, partly because it is (apart from the Caspian Sea) landlocked, so has no coastline for demarcation. Since September 11, Afghanistan has often been classified as Central Asia. The north of the country, bordering Uzbekistan, has a large ethnic Uzbek population; in the east, Tajiks are a significant minority. By religion, culture, and language, the Uighurs of China’s Xinjiang Autonomous Region have more in common with the Kazakhs and Kyrgyz than with the rest of China, and Uighur nationalists dream of reuniting with their neighbors in a Greater Turkestan region. The Caspian Sea clearly divides the Caucasus republics of Armenia, Azerbaijan, and Georgia, and the Russian republics of Dagestan, Chechnya, and Ingushetia, from Kazakhstan, Uzbekistan, and Turkmenistan, although some policy experts lump them together as “Central Asia and the Caucasus.” What about Mongolia? Ethnically, Kazakhs and Kyrgyz are Mongols. Unlike other regions that can be neatly subdivided, Central Asia is amorphous, expanding and contracting as it is viewed through different political, social, economic, and cultural lenses. In this book, I use the narrow political definition of Central Asia to refer to these five former Soviet republics--: Kazakhstan, Kyrgystan, Tajikistan, Turkmenistan, and Uzbekistan. Since 1995, I have faced the challenge of trying to explain the region to colleagues, students, and friends. After one trip to Kyrgyzstan, a colleague insisted I had been in Kurdistan (which does not yet exist, except in Northern Iraq and in the maps of Kurdish separatist movements).